Make a career out of caring with our Senior Living Management program and a generous scholarship opportunity from the Arizona Assisted Living Federation of America (Arizona ALFA)! 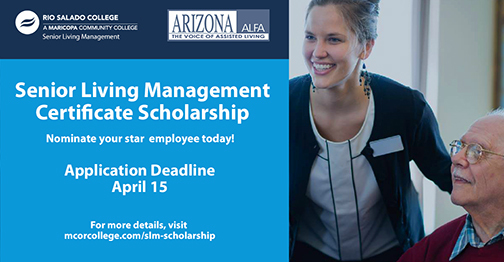 This Arizona ALFA scholarship is available to assisted living employees who want to advance their career in the senior living industry and quickly grow into an executive level position. The deadline is April 15. Apply now! Our certificate program is designed to help you advance your career or step into a new field that will prepare you to work with seniors and their families at a management level. This lucrative career path combines business management with caregiving and allows you to quickly move into executive-level positions.